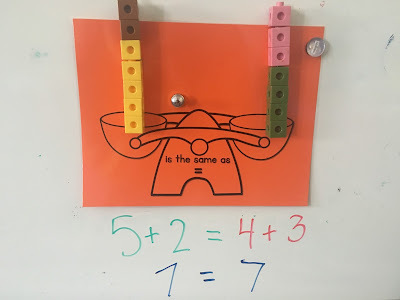 We are learning how to balance equations. 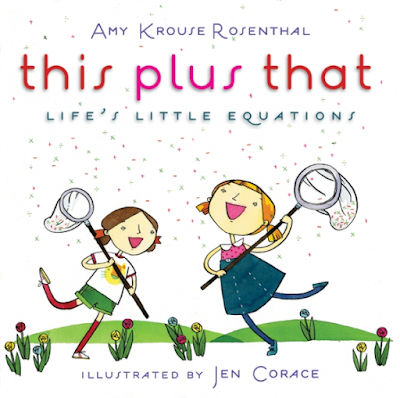 We learned that the equal sign ( = ) means "the same as"
To introduce the word "equation" we read this book and made up some funny word equations. These were from the book : "small + bottle = baby" and "tall + coffee = grown-up"
but students had difficulty when we switched things around a bit 5 = 2+? We had been relying on standard equations for too long! We used an actual balance scale to physically balance cubes to find out what "balanced". The Grade 2's learned how to balance in a more complicated way. They tried equations like 5+2 = 4+? We learned to solve one side of the equation, and then solve the other side. Our balance scale mat really helps to remind us how to solve the equations.